The more time I spent reading about marriage and how cultures are shaped, the more I realized, that he was right. The daily decisions we make, and habits we form are ultimately who we become in life and marriage. Unless you’re a celebrity or the president of the United States, life is not defined by one or two major decisions. More importantly, and often overlooked, the daily things we decide not to do, also influence and shape what kind of environment our families live in. If I daily choose to take out the trash in my kitchen, my kitchen will be a place to spend time in, cook meals, and feel at home. If I choose not to take that trash out, our kitchen will no longer be a place we want to spend time in. Likewise, if I am not in the mood or it is an inconvenient time for me to etch out moments to intentionally love and give time to my wife, I am going to create something in our home I never intended to create: an untrustworthy, unreliable, unsafe place for my wife when difficulties inevitably come. We are always telling our families what to believe about us and about themselves, whether that comes through action or inaction. We tend to think of major events like affairs, fights, and divorce as moments in vacuums not really influenced by everyday choices. “She just lost it.” they might say, “It just came out of nowhere.” But that is rarely ever the full story. The cultural ideals around us (sadly even Christian culture) convince us that marriage is about us finding the person destined to fill the empty, relational hole in our hearts. Within those same ideals, we are convinced that we are the same relational answer to our spouse. Inevitably in marriage, we all discover that the person we married can’t fill that hole for us. It’s never a matter of if we will discover this, it’s really only a matter of when we will. The reality of living in a broken world is that we are all destined to fail one another. What really matters is how we actually respond when our spouses do let us down. For a Christian, living in light of the Gospel must compel us to think of marriage in a different way. Instead of being people who are disappointed or angry when our spouse fails, what if we were a people who anticipated failure and, like the prodigal’s father, ran towards the opportunity extending grace? Ultimately, living in light of what Jesus has done for us, this is what believers are called to be for our spouse: a vessel of Christ-exalting, gospel-centered grace. What is grace exactly? In the Christian context, the word simply means: unearned favor. It is looking at someone who doesn’t deserve your kindness and generously extending it toward them in an act of goodwill. What does that mean for us? It means that instead of allowing someone to take on the punishment that they might deserve, you take it upon yourself and absorb the consequences of that failure. Does that sound like anyone you know? I hope it sounds familiar. It’s only through the power of Jesus’ life, death, and resurrection that we can find the strength to extend unearned favor towards our spouse and others. When, through the Spirit, we can grasp what’s been done for us, we can be set free to give it away ourselves. Meanwhile, the house is burning down and no one is brave enough to call the fire department. Most churches are responding with care when it’s too late. I, for one, am tired of only seeing Divorce Care signs in front of churches, waiting to care for people when they’re sitting in the ashes. Instead, we should be looking to care for people in the every day smoke ready to put out the flames. Here is the bad news: we are deceptive, selfish, and sinful by nature. On a day to day basis, it’s hard to detect what our problem is. Because of the deceptiveness of our hearts, it's hard to put into words what is actually going on. Even when we do find out what’s going on we convince ourselves that it’s probably not our fault, but our spouses'. On top of that, we convince ourselves no one else needs to know what’s wrong. A lack of transparency, vulnerability, and honesty when sin and suffering arise will always be the downfall of any marriage. 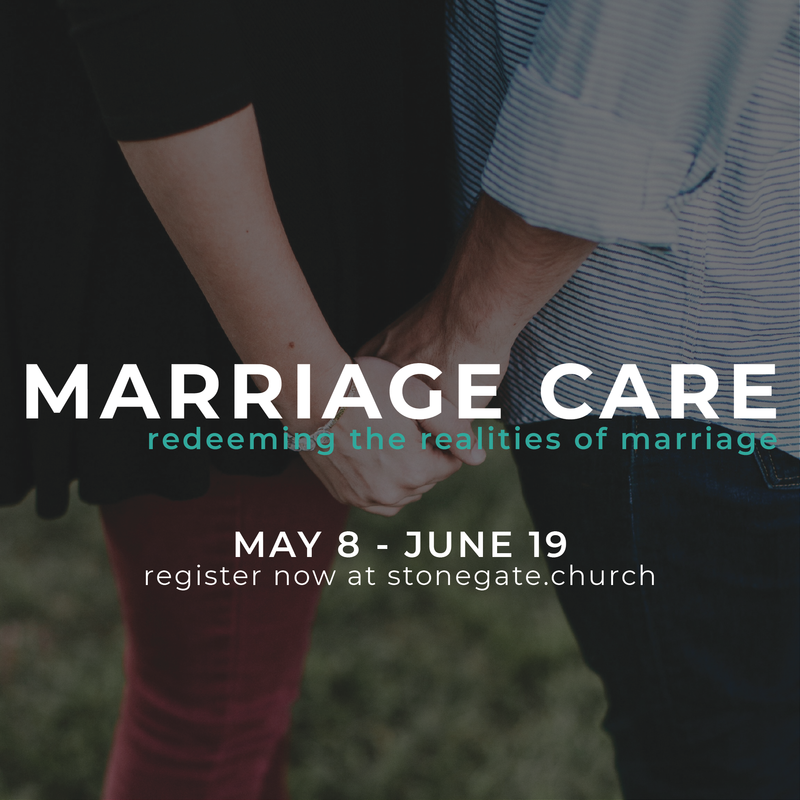 Marriage Care at Stonegate Church is meant to be a class for those of us who want to work on and improve the health of their marriages. It is designed to take your eyes off of yourself and direct your gaze upward towards Jesus. We spend about an hour together as a large group going over material connected to Paul Tripp’s book What Did You Expect?. This is followed by breaking up into smaller groups to discuss what the Lord is showing us. Each group includes a mentor couple that will help guide you through what you’re learning and lovingly help point out some things that you may not be seeing. It is amazing what God can do within a marriage over seven weeks. We have seen people mired in unfaithfulness walk away from the edge of divorce and into reconciliation. We’ve seen years of directionless leadership find a footing on solid ground and actually head towards a destination. We’ve seen self-righteous victims become faith-filled grace givers. There is one common denominator all of these stories share. They all asked for help. Maybe you tend to point the finger. Maybe you tend to take too much of the blame. Maybe you struggle with bitterness and anger. Jesus stands ready and willing to welcome you in and compels you to extend the same open arms towards your spouse. There is no reason to act like everything is okay if it isn’t. The gathering of blood-bought believers in a church is built on this idea: that we are all screwed up and in need of saving. We have no one to impress here! Letting your defenses down and asking for help is actually where joy is found. We hope that you will join us! We can’t wait to see what God will do. You can sign up for our next Marriage Care class by clicking here. Classes fill up quickly, so don't delay!